Our hope in Him alone! 1 Praise the LORD! Praise the LORD, O my soul! 2 I will praise the LORD while I live; I will sing praises to my God while I have my being. 3 Do not trust in princes, In mortal man, in whom there is no salvation. 4 His spirit departs, he returns to the earth; In that very day his thoughts perish. 5 How blessed is he whose help is the God of Jacob, Whose hope is in the LORD his God, 6 Who made heaven and earth, The sea and all that is in them; Who keeps faith forever; 7 Who executes justice for the oppressed; Who gives food to the hungry The LORD sets the prisoners free. 8 The LORD opens the eyes of the blind; The LORD raises up those who are bowed down; The LORD loves the righteous; 9 The LORD protects the strangers; He supports the fatherless and the widow, But He thwarts the way of the wicked. 10 The LORD will reign forever, Your God, O Zion, to all generations. Praise the LORD! Let us hear what the Lord answers the prophet, - and then you can compare your answer to his: “A voice says, "Call out." Then he answered, "What shall I call out?" All flesh is grass, and all its loveliness is like the flower of the field. The grass withers, the flower fades, When the breath of the LORD blows upon it; Surely the people are grass. The grass withers, the flower fades, But the word of our God stands forever.” (Is.40:6-8). Now let us hear what the word of God says; because we so often read through it, without really listening to what it says. God’s word speaks regardless of what we think and feel in this matter - and not like the "kind" priest or the preacher. - It will not spare us for the truth; because He knows that if you do not hear or meet the truth, and if this truth – this light – which He lets you take part in, cannot find room in your heart, you will be lost forever. Therefore He won’t spare you. You are an object to an incredible grace, when the truth comes to you, and therefore it gets serious consequences, if it gets denied. And what did we hear in the passage in Isaiah? “All flesh is grass!” Did you hear? – Not just most of it – No, everything! And then: ”- and all its loveliness is like the flower of the field.” Again: - Not just most of it, - but everything! God’s word is radical in meeting us, because we do not walk in truth, nor light, but in darkness, - it leaves us nothing, it takes away all hope we have in ourselves and our own. And why does it do that? – Yes, because it is exactly what the truth is, - there is nothing in this we can build on, in this context, - and the sooner we realize this, the better. Our rescue lies in this acknowledgement! No one reaches for the rescue rope, until he realizes that he will meet death without it. So what scorches our flesh is grace from God! Everything! – is put aside. Stop and consider that, where you are sitting right now - you are not to be counted, - you are not important in this connection. There is only one who is important in this connection; - He carries a certain name, among others; we read about Him in the book of Revelation: “And I saw heaven opened, and behold, a white horse, and He who sat on it is called Faithful and True, and in righteousness He judges and wages war. His eyes are a flame of fire, and on His head are many diadems; and He has a name written on Him which no one knows except Himself. He is clothed with a robe dipped in blood, and His name is called The Word of God.” (Rev.19:11-13). The word of God! What did we hear in the passage in Isaiah – after the judgement over all flesh and all its glory has fallen? : “But the word of our God stands forever.” The word of God! – But that is His name! In other words: Everything of our own, will fall in meeting with the Almighty God, - when the breath of the LORD blows upon it, as we read. - But Jesus will endure! – His person and His work! That is also exactly what the apostle points to, when he preaches: “Jesus Christ is the same yesterday and today and forever” (Heb.13:8). Maybe you notice some sort of protest in your heart, when you hear this message from the scripture, - a riot, and irritation, - that is your flesh meeting its death sentence, and it will not die. It is natural that everything that lives wishes to live too; - also your flesh, - but when it dawns for you, where it has taken its life from, maybe you want it to die! Read the story about the fall in Genesis chapter 3, you will see where this life dates from. So, if this protest wins in you, you will be left standing with what goes under in your meeting with God. 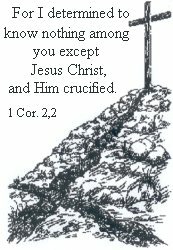 This brought Jesus enemies to go so far, that they crucified “the Lord of the glory” (1 Cor. 2:8). You heard what was said about the glory of the flesh in Isaiah, - and here we are standing in front of the Lord of glory! – it is His Spirit that enters into and settles down in a believer. This (flesh) cannot live side by side with a true God life – one of them has to go out. “For the flesh sets its desire against the Spirit, and the Spirit against the flesh; for these are in opposition to one another” (Gal. 5:17). It is so perfectly clear that this won’t function! Just think if a marriage, - or any other communion for that matter, - where they are in opposition to one another! – It will go to waste! Who has conquered in you? In Psalm 146 we meat this message again, - and when you first have got your eyes opened up for it, you will see that this is to be found through the whole Scripture. We read about the Lord’s warning to us in this Psalm, and the Lord’s request which means exactly this: “Do not trust in princes, In mortal man, in whom there is no salvation. His spirit departs, he returns to the earth; In that very day his thoughts perish” (v.3-4). This is how it usually goes, when the faith in you fails, - then you put your trust in something else outside of you; - it might be someone who preaches, a believer’s movement, a certain organisation etc., - but also something human. There we meat the warning from the Lord, - and then comes the request, from Him who wants this one thing for you, - something He proved by the cross on Golgotha – your salvation: “How blessed is he whose help is the God of Jacob, Whose hope is in the LORD his God, Who made heaven and earth, The sea and all that is in them; Who keeps faith forever” (v.5-6). But the thing is that without an acknowledgment from your flesh before hand, then the request from the Lord will glance off, - you will not be able to follow it! You should notice that when the Lord comes with a request, He speaks to a certain people: “Who executes justice for the oppressed; Who gives food to the hungry The LORD sets the prisoners free. The LORD opens the eyes of the blind; The LORD raises up those who are bowed down; The LORD loves the righteous; The LORD protects the strangers; He supports the fatherless and the widow, But He thwarts the way of the wicked” (v.7-9). This shows that those who know their misery, sin and incapability in spiritual things, - I kind of do not make it as a Christian, - no, I am not able to be a Christian at all, - especially not a good Christian! – It shows that God has opened a way for those: “I know your deeds Behold, I have put before you an open door which no one can shut” (Rev. 3:8). Yes, He knows about your deeds, but look! – He has opened a door, and this door is Himself, which He says in John 10, the chapter about the good Sheppard: “I am the door!”(John 10:9), - and who can shut it? He answers Himself: Nobody! But you can turn your back on it, and choose your own door instead. I only hope that the word of God has made this clear to you and how it will all end. 1 Praise the LORD! Praise the LORD, O my soul! 2 I will praise the LORD while I live; I will sing praises to my God while I have my being. 3 Do not trust in princes, In mortal man, in whom there is no salvation. 4 His spirit departs, he returns to the earth; In that very day his thoughts perish. 5 How blessed is he whose help is the God of Jacob, Whose hope is in the LORD his God, 6 Who made heaven and earth, The sea and all that is in them; Who keeps faith forever;7 Who executes justice for the oppressed; Who gives food to the hungry The LORD sets the prisoners free. 8 The LORD opens the eyes of the blind; The LORD raises up those who are bowed down; The LORD loves the righteous; 9 The LORD protects the strangers; He supports the fatherless and the widow, But He thwarts the way of the wicked. 10 The LORD will reign forever, Your God, O Zion, to all generations. Praise the LORD!" This is written down by someone who has bathed in the light of the truth, - and what he has seen makes his heart rejoice. Just listen: “Praise the LORD! Praise the LORD, O my soul! I will praise the LORD while I live; I will sing praises to my God while I have my being.” (v.1-2). This Psalm starts with and ends with: Praise the Lord! This is how it is with a man when he first meets and sees the Lord, as He is, as his saviour and reconciler! – And as we meet here: He is this for ever! – And this is how it is when one ends this life, and walks into eternity! It becomes the testimony of Moses for every believer, which will be allowed to live in a communion with Him: “There is none like the God of Jeshurun” (Deut.33:26). Maybe it is worth getting to know this Lord, for you, if it already is not that way?